Day 14 began at 6 am with Matt trying to get the mirrored sliding door back on its tracks in our closet. After asking sleepily yet nicely if he could maybe fight with that door after work (i.e. let me sleep! ), I got a call from our receptionist who's baby had just thrown up... I needed to go in early to cover for her. It was 6:20. In order to open at 7 I needed to leave by 6:30! Needless to say I ran out the door before I could remember many things. C. to take a picture of the outfit for the day. Black top, gray pants, and the super soft Vera Wang scarf that made me feel like I was still wrapped up in blankets in my bed at home...sigh. I actually went home and slept for four hours after work. Day 15 I woke renewed and refreshed...aided by the extra four-hour nap I had had the day before. I even had it in me to wear a dress, but I'm getting a little tired with the same old smile at the camera routine. And I'm not that photogenic so for every picture you see there are about 12 in which I have a weird face/bad lighting/awkward smile/general non-attractiveness. 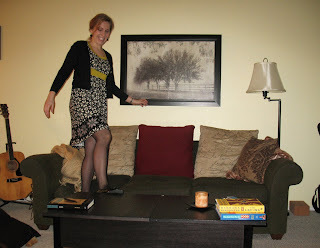 So I decided to jump on the couch and coffee table while waiting for the camera timer. This also gives you a chance to admire our new piece of art hanging over our couch...a $17 steal from Target! Oh, and my $8 dress from Target. I love Target. And I forgot to clean out my mug again...ew. Matt and I decided to puddle around Issaquah, Maple Valley and that general region to scout for apartments. We're in no rush to move, exactly, but we are looking tentatively for a place with lower rent. However, with so much square footage, quiet and nice neighbors and a view to die for we're having a hard time convincing ourselves. Nevertheless, if we could save a big chunk of change every month to put towards paying off debt/loans and then start saving for a home it would probably be a good thing. At least that's what I keep telling myself. This particular skirt I wore I've had since high school. Its my hippie let-the-sunshine-in skirt. The kind that makes you want to run through a grassy field in the sunshine. Only its January...and there wasn't much sunshine. 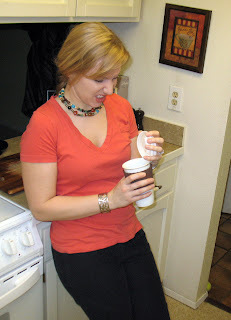 I kept swapping tops trying to make it both cute and warm and the best I got from my clothing critic (i.e. Matt) was, "That's not bad..."
Which we women know never means its good. 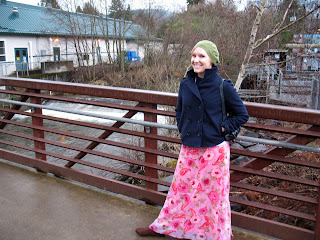 Oh well, checked off my list...my bright pink hippie skirt and me at the salmon hatchery in Issaquah. Can you see the little baby salmon in the glass behind me? Do you see me being a dork and showing my nifty boots? Yeah, not so cool I realized after Matt snapped the picture. Day 18 at long last. Aren't you glad this is almost over? That night I reheated the beef bourguignon I had made the night before, whipped up some garlic mashed potatoes (and to my co-workers, if you read this, if I stink tomorrow blame it on the two whole HEADS of garlic that went into those potatoes! ), and opened a bottle of Pinot Noir for a nice dinner with my hubby. Since I don't think ratty cleaning pajamas count for this challenge this is what I changed into after I finally took a shower and cleaned up. I had the apron on and Matt commented, "All you need are some pearls, now," so out came the pearls! I'm not really a "pearls" girl...but sometimes there are exceptions. I'm almost through my first cycle of bottoms...I think I only have two or three pairs of pants left and one or two dresses...things might continue to get interesting in this challenge! The Conduit is a Christian non-profit organization based out of Franklin,Tn. The Conduit was started as a Bible study September 16th 2007 with a goal of being a “conduit” of God’s power, God’s love, and God’s resources. The Conduit partners with organizations that are providing basic living needs such as food, clothing, shelter and medical care. The over head of the organization is kept low in order to accomplish the goal to “live simply that others may simply live”. Back to the charity though. On one of their posts (their website is set up almost like a blog with updated posts), it states, "This week we have 42,000 lbs of food as well as water filtration systems arriving in Jacmel Haiti for our friends at Restoration Ministries. " You can donate to The Conduit Mission by clicking HERE. As with all the charities I've spotlighted, donations over $100 are available to receive an end of year tax giving statement from The Conduit upon request. The Conduit is a federally recognized 501c3 non profit organization. Anyone else got a charity to spotlight? Is your office doing something? Your church? Your knitting club? Let me know!